This LEGO Technic Porsche 911 GT3 RS 42056 is a perfect addition to a LEGO Technic collection. This LEGO Technic model is designed to provide an immersive and rewarding building experience. Developed in partnership with Dr. Ing. h.c.F. 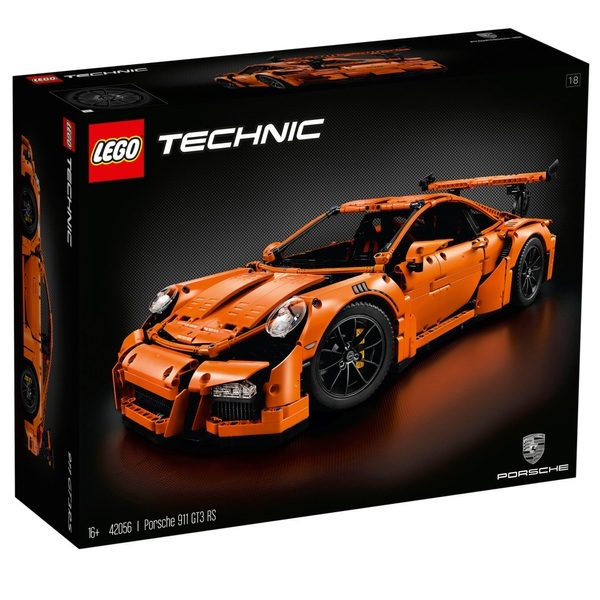 Porsche AG, this elegantly packaged LEGO Technic Porsche 911 GT3 RS with its sleek aerodynamic lines, adjustable rear spoiler and orange bodywork is packed with authentic features and functions that capture the magic of the iconic supercar, and the attention to detail is clear from the outset! Open the doors and you'll discover an elaborate cockpit with racing seats, working gearbox, steering wheel with gearshift paddles, detailed dashboard and a glove compartment containing a unique serial number. Lift the rear lid and you'll have access to a detailed flat 6 engine with moving pistons, while under the hood you'll find a storage area with suitcase. Red suspension springs, detailed brake callipers and original-design rims with special low-profile road-ripping tyres add the final touches to this magnificent model!